For everyone who understands and appreciates the value of public education, the National School Boards Association is providing an excellent platform to demonstrate their support for public education. There is no ordinary day in our public schools. Great things are happening but often go unnoticed. Extraordinary teaching and learning and acts of heroism take place during every hour, every day, every year. 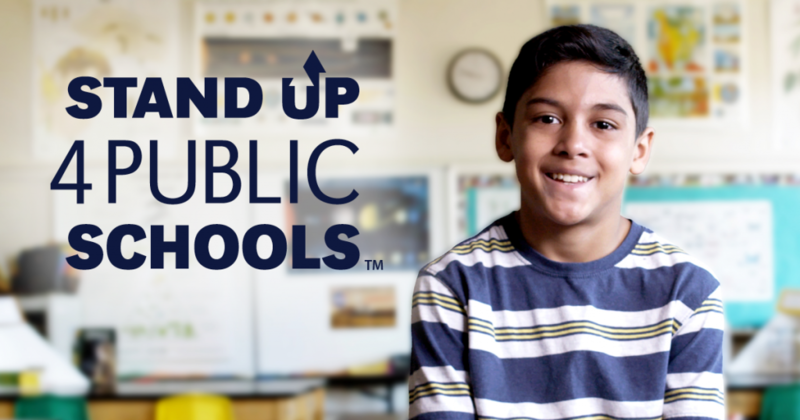 The Stand Up campaign provides the public with a more accurate and thorough perspective of public education by capturing the ordinary, yet extraordinary activities and the dauntless and bold actions of educators – teachers, administrators, superintendents, and school board members – that help prepare students for the future. The campaign highlights the creativity that is prevalent in our public schools, which produces unique and amazing activities and outcomes every day. It reveals the true teaching and learning in public schools and it provides a means for people to demonstrate support for their schools. The day-in-the-life-of our public schools is inspirational. The teaching and learning that takes place demonstrates that no day in a public school is “typical.” Indeed, every day is a special day. NSBA’s The Stand Up 4 Public Schools campaign is aimed at telling the full and rich story of public schools. The campaign highlights the creative, innovative, and extraordinary ways public schools are helping students prepare for their future, enhancing the quality of life in their communities and helping generate future prosperity. The Stand Up campaign’s enables NSBA to tell the story through first person accounts and by showcasing programs and people doing great work. A key feature within the site is the short movie, No Ordinary Day, which brings the strategy and story to life in a compelling way. ASBSD encourages you to go to the website to highlight programs and people deserving recognition. You can provide a little information on the Contact Us page on the website and NSBA staff will follow up with the appropriate people so their story can be featured. It’s imperative we do a better job of telling public education’s story so the public and policymakers understand that every single day something great is happening in public schools.